It turns out that event is TODAY. Yesterday’s event in the same space? 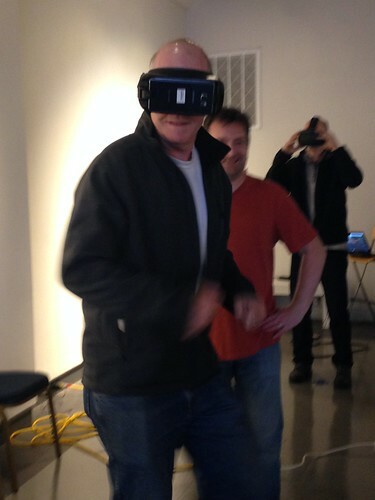 A showcase of Virtual Reality immersive art and gaming, with about five stations of VR headsets to try out. 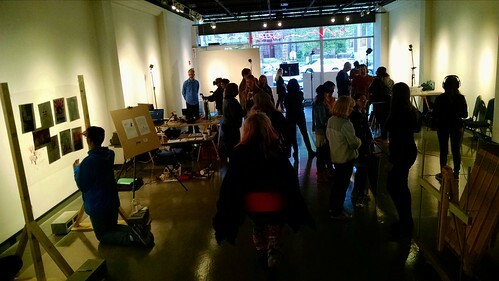 This VR event was connected to a local film festival going on up the street in the downtown theater. We live in a very art-orientated community. 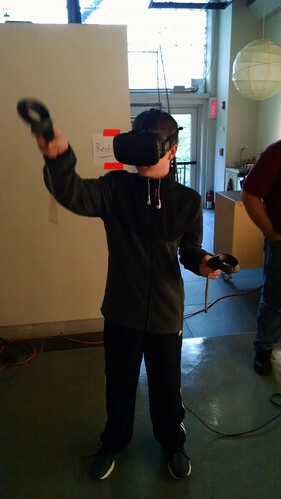 In one VR station, you walk a plank jutting out from the top window of a skyscraper and then you need jump to the ground (that one freaked out my wife). In another, you play a version of Frogger, running through traffic to get to the other side. That was fun, if a little frenetic. One other area had someone printing out local Snaps from Snapchat, using some local tag, and the printed images were then put on one side of a plexiglass wall. Visitors were invited to doodle with markers on top of the image (but on the plexiglass side), using the Snap as the frame for art, and then the original was removed, leaving the doodled art in thin air (on the plexiglass). My favorite (and my son’s favorite) was a station in which you can use the Google software called Tilt Brush, which allows you to draw with all sorts of colors and inks and techniques in a virtual landscape of your choosing. It felt as if you were surrounded by ink, and waving the wands brought the pens into motion. I started to draw in space, and then on the desert, and then with bubbles in a pink surrounding. I have never heard of Tilt Brush, have you? At the front of the gallery, an artist was hard at work, using Tilt Brush and her own VR set to make some sort of gallery art installation in Virtual Reality, and watching her work in silence was fascinating. She’d wave her wands, as the monitor screen showed her art in progress. So, a mistake made for an afternoon adventure, and the cool thing is? That original Book and Print Festival is still happening later today, so I have a chance to get “immersive” in good ol’ paper and ink.